Ted Seward, ResponsePoint’s Director of Marketing and Business Development, shares his thoughts on the effectiveness of customer relationship building via direct human contact and telemarketing. This post is a spin off from comments that originated in the off script interview. As inbound marketing becomes a more common way of connecting with potential leads, it may also be causing businesses to put aside any phone or telemarketing contact tactics. This in turn can really dilute the most effective part of customer connection—the relationship building that occurs during a one-on-one conversation. It’s not totally due to an inbound tactical focus, though. The use of phone calls as a sales tactic has been slowly and steadily declining for some time. I’m going to address this from the perspective of both Sales and Marketing. It always amazes me that teams I consult with consistently have no requirement or minimal expectations for the sales team to make phone calls. Too many sales folks are looking for highly qualified leads—and they should be. But without picking up the phone you might not hear the objections or know what a qualified lead might be. Insights continue to increase around progression in the customer journey, and sales teams need to pay attention to those insights. Many executives might question the needed headcount in sales, especially if sales is only responsible for 30% of the customer journey and closing. For the longest time, marketing lost contact with leads once it was designated a “lead” and was in a CRM, which was often owned by technology or sales. Now with the marketing technology stack developing, there are more insights that help improve this from a marketing perspective. Marketing Automation and the ability to track, while still fairly limited on prospect attribution intent and influence, it does allow you to keep track of some of the engagement via other metrics. “This has started to expose the black hole of marketing -Where leads go flat or leads that sit when handed over to sales.” This common “gap” is also indicating another issue from a marketing perspective and that includes clear accountability on quality and the need to improve nurturing. The best scenario is one where marketing owns the lead management, including sales development and lead nurturing. This is the team who isn’t afraid to pick up the phone and do the work necessary to refine leads. This is even more important in establishing a healthy ABM strategy. I see many teams relying on automation as a quick shortcut. This will be further complicated as the concepts and work around artificial intelligence and predictive marketing continues to evolve in the marketing tech stack. In reality, many high-value transactions first require developing a relationship of trust to ensure the progression of the customer journey. Without establishing a trusted and authentic relationship, you lose the continuity and emotional connection that binds human experience across the marketing and sales process. “68% of B2B sales were found to involve some form of human interaction such as telemarketing. Long before the advent of marketing automation, I was an advocate for campaigns proving ROI. It was paramount that I proved marketing’s contribution to pipeline and revenue. Refining targeted messaging started and finished with data. And now, in a much more data-centric marketing world, the tools and approaches have evolved, but the fundamentals remain. Developing and implementing a lead process for sales and marketing objectives is absolutely necessary to navigate the inherent challenges of a complex process, disparate data, and variable systems. Businesses are often paralyzed by their overly complex CRM and API integration around data. Now, more than ever, marketing is a discipline requiring vigilance, strategy and smart data management. Are you interested in learning more about how outbound marketing can boost your ROI and your customer retention? Get in touch with the experts at ResponsePoint. We’d be happy to give you a free 15-minute phone consultation and answer any questions you may have. Are you completely against outbound marketing and phone calls? Ted weighs in on the hesitancy to pick up the phone. How are you generating leads now, and how is that working for you? What is sales saying about the leads that Marketing generates? What does Marketing say about the leads they hand over to Sales? Is the complaint from Sales that they don’t have enough time to sell? 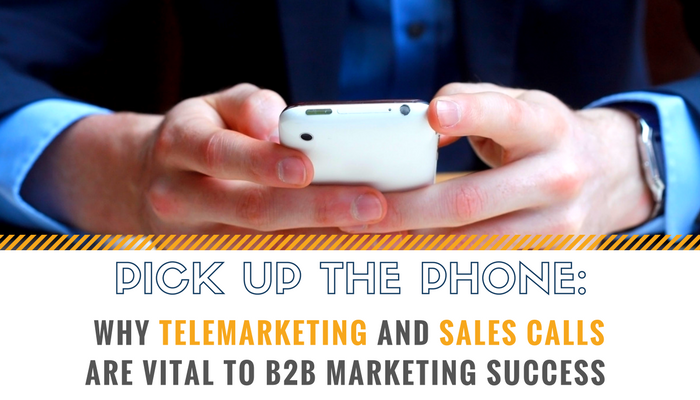 Let’s face it, much of the negative connotation of telemarketing is driven not by B2B telemarketing professionals or SDR sales development representatives, but by the siloed B2C efforts. In addition, the sheer volume of offshore bombardment does not help. Certainly, B2B telemarketing is not right for every situation. Typically, it is tough to justify for transactional or low-cost products or services. It is easy to be fooled by organizations who focus on high volume or exchange appointments for pay. That said, for a more complex sales process, telemarketing by a reputable company is often the best way to cover more ground, help with intermediary conversations, and develop, nurture and build trust with your audience. This is not boiler room, script-based telemarketing, but rather professional SDRs trained to pick up the phone and have a productive and connective conversation. We see and hear it over and over…one of the biggest obstacle for many sales teams is the lack of time actually selling. The overarching mantra for any marketing and sales team is to keep your sales team selling. That should not mean pushing quantity over quality. In fact, it should mean reducing the cost and the amount of time spent on bad prospects, so you can focus more time on the best prospects. To optimize your sales team’s effectiveness and sales acceleration, and to actively create and use market profiling, list building and lead nurturing, telemarketing must be part of the mix. Initial objections are best handled by skilled telemarketing and Sales Development Representatives who provide solid measurement and consistent ROI. This is the better alternative to utilizing a high-cost sales executive who is best used for closing business and selling vs. separating viable prospects from zero potential. Done right it is efficient, scalable and sustainable to influence and engage prospects, and it ensures accountability along the customer journey of nurturing a lead. This is part of a four-part blog series partially excerpted from an interview Ted Seward gave to Sword and Script. Frank Strong is the founder and president of Sword and the Script Media, LLC, a veteran-owned business focused on PR, content marketing and social media for the B2B market space. You can find the original article here. Other Posts from this Series.